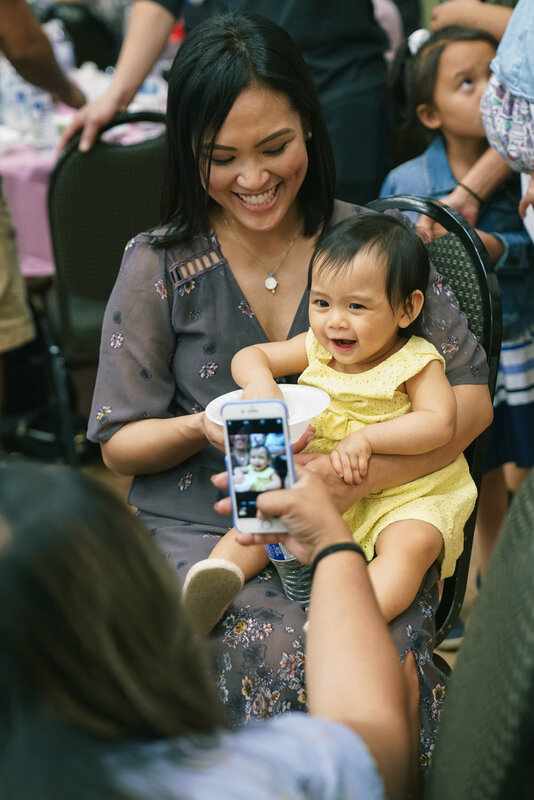 We've said it before and we will not get tired of saying it that one of the best things about this business is really the people that we have the opportunity to work with in helping create special milestones in their lives. Cultivating friendships with our couples even past their event and watching their families grow is the best takeaway that I can ask for. Jill & Raph is no stranger to us - they're one of our most loved couples that we were lucky to work with in 2014 for their wedding. 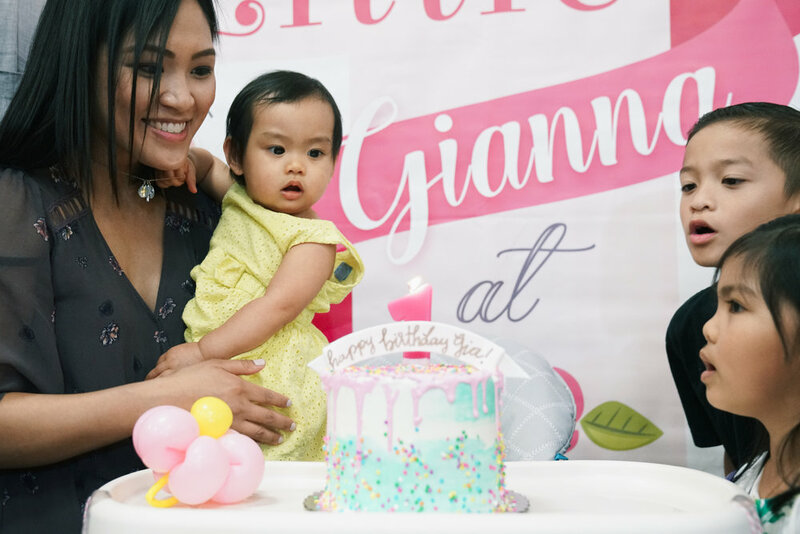 When Jill reached out to us in planning their daughter Gianna's (or Gia for short) first birthday, we knew we just had to do it. 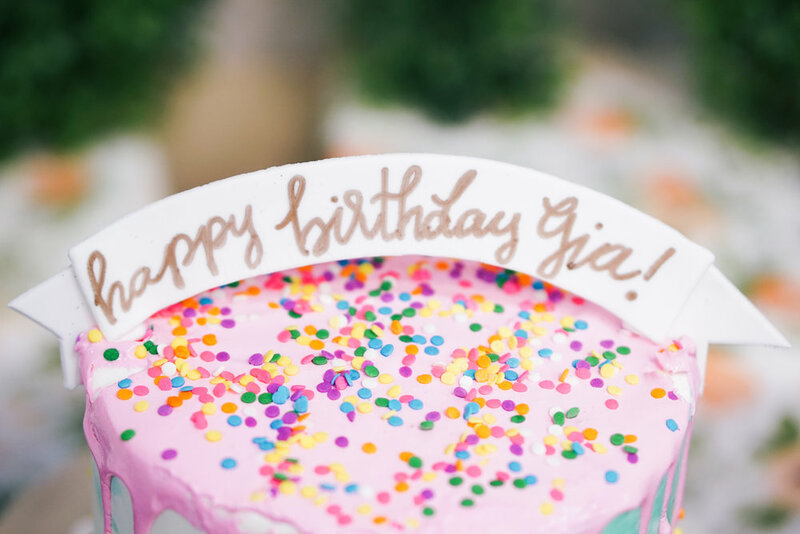 Gia's birthday was right around the first day of Spring so naturally we wanted to do a Spring inspired celebration filled with lots of happy colors, blooms and friends who love our birthday girl so much. Since our event space was a blank canvas for us to fill with color, we decided to use the light pastel colors of Spring that we love so much. What would Spring be without any fresh blooms right? We took inspiration from our trips to the local Downtown Flower Market and saw what was in season and in budget for our client. We created bouquets of tulips, stock flowers and wax flowers to create the Spring mix bouquets in each table. 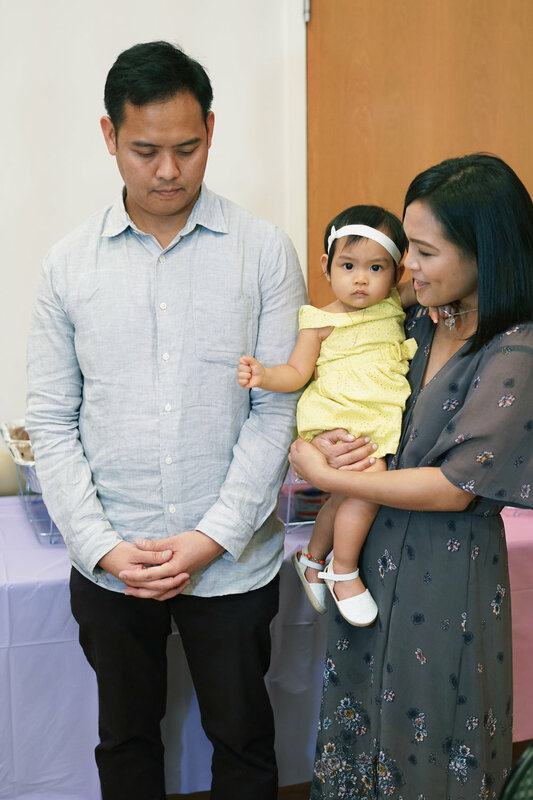 One of the local Filipino restaurants catered the celebration with various Filipino dishes to choose from including a roasted pig or lechon as the main centerpiece of our buffet setup. One of Jill's requests for Gia's birthday celebration when we first met was to create a dessert & candy table set up. We wanted to bring the outside elements into our table and used a few cherry blossom branches with pink cherry blossoms peeking out to anchor our table. We also found these faux boxwood letters that spelled ONE and used it as our focal point in the table setup. The yummy dessert & candy table was filled with our favorite mini desserts from Porto's Bakery and Gia's smash cake courtesy of Hapa Cupcakes. 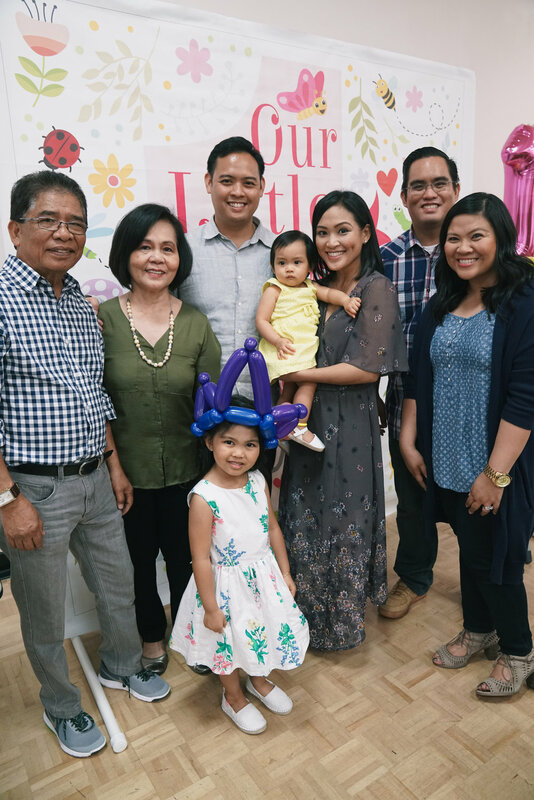 One of Gia's Godmother/Ninang Leah created a time capsule station for the celebration where guests were asked to answer questions and write their messages for little Gia. 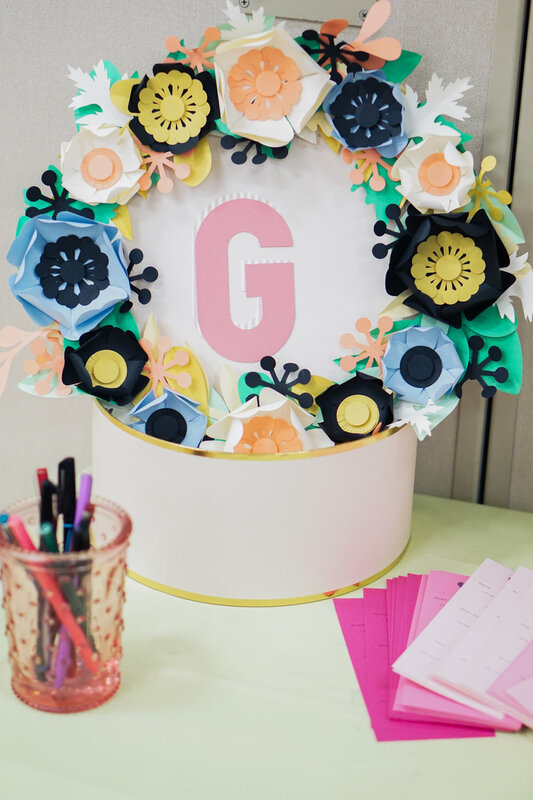 Leah constructed this beautiful paper flower wreath that topped the time capsule which will be re-opened on Gia's 18th birthday in 2034 to remind her of all the love that surrounds her and this love-filled Spring day. Photos! Photos! Photos! The only way you’re going to know what dresses you like is by looking! Start off looking at photos online, magazines, designers’ websites, etc. Try to stick to actual sites that have the dress photos on them and not something like a Google Image search- it will be easier to know the designer if you do that! And then of course save whatever you like. Budget: If you know you're not going to spend $20,000 on your dress, don't waste time trying on a bunch of gowns out of your range. You're better off focusing in on your realistic price point so you can spend more time editing down the beautiful options you can actually buy. Also, keep in mind that you'll need to factor in the cost of alterations, taxes and shipping fees, plus your veil, shoes, lingerie and jewelry, which can add up to $500 or more altogether. Just like with any other type of search for inspiration, you’ll want to weed out what doesn’t quite stand out to you after a few hours or days. Go back and look through everything again, remove photos, and refine your “collection” of dresses that you like. Repeat if necessary. You should see some sort of pattern once you’ve refined what you saved. It could be a fabric, a dress style, a type of embellishment, a color, or even a designer. Gather the similarities and define them. Know what it is that you’re liking so you can tell the dress store. Plan your days of dress shopping. Make sure to plan multiple days of shopping since you may not find the one on your first day out. Look up all of the bridal shops within an hour of where you live/where you’re shopping. Look up their reviews online too- I recommend Yelp or WeddingWire. Some bridal salons can be awful and may ruin your whole dress shopping experience, and some are exceptional. And if your heart is set on a designer, of course look up what stores carry that designer. Make sure to schedule appointments at bridal salons - that way you can have a consultant dedicated to you that will be able to answer your questions. More reason to plan out your day! Call in Advance - Just because a salon carries your favorite designer doesn't mean it'll have the exact dress you've been dying to try on. If you phone beforehand and request a specific style, chances are the salon will be able to call in a sample of that gown especially for you. While you may get lucky and snag a salesperson just by walking in, scheduling an appointment guarantees you'll get a full hour of undivided attention. 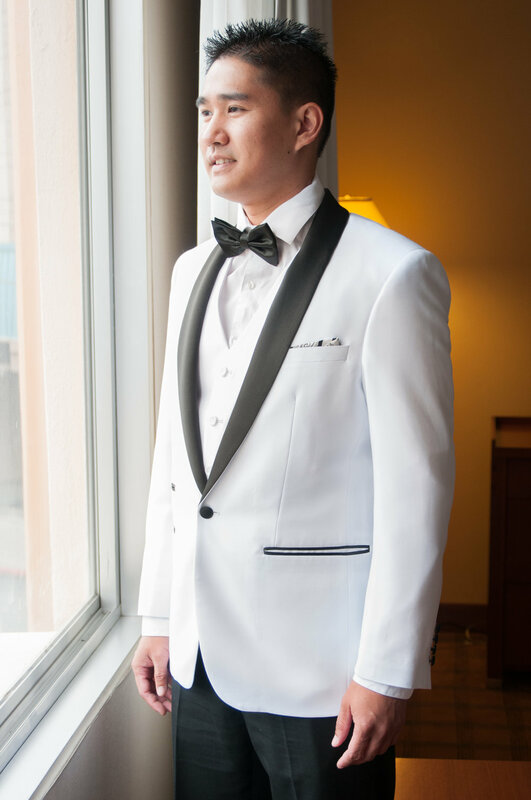 Plus, many salons require you to book an appointment in order to try on gowns, so you'll want to call ahead. Let the Salon Make Recommendations - Don't eliminate anything at first glance. If the salesperson brings you something she says you should try, try it—even if you don't initially love it or think it's totally “you." It's possible to fall for a wedding gown you didn't think you'd like or want. Not every dress looks great on a hanger, and you might have to let go of some preconceived notions and keep an open mind. 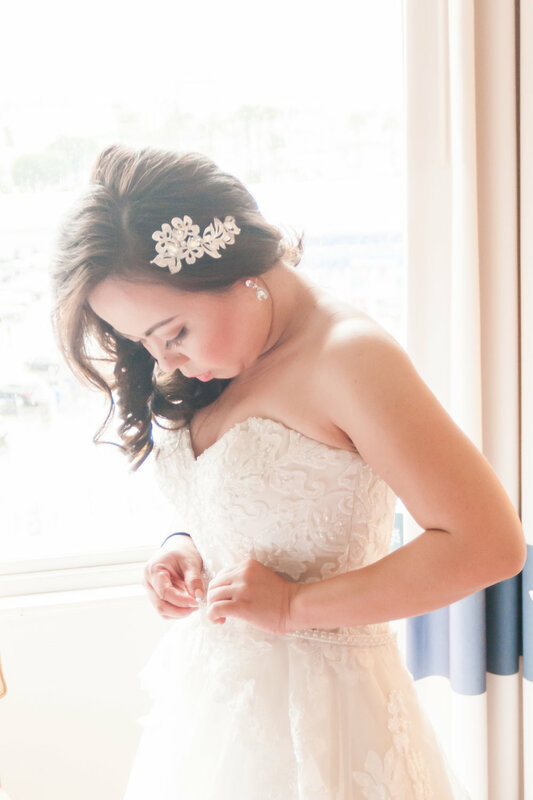 One of our favorite local salons is Love and Lace Bridal Tailor in Irvine, California. Besides the beautiful aesthetics of the bridal salon, they really know how to take care of the bride and all of her needs. We have referred many of our brides to this salon for this reason. Once you’ve done your research and planned out your appointments, it’s time to shop! Remember, it’s okay if you don’t find “the one” at your first store or on the first day of shopping. Also remember to keep an open mind when you’re in the bridal shops, because dresses look very different on you than they do on the hanger. Oh and most importantly, take your time and don’t rush. 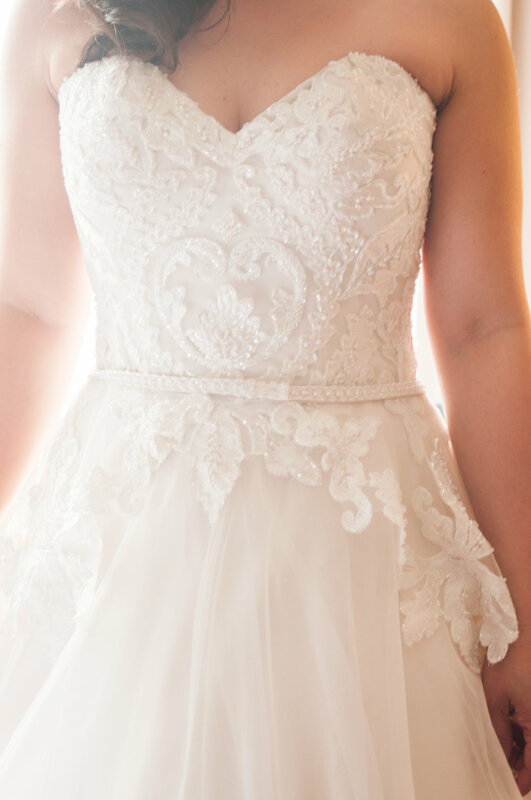 If you have trouble deciding whether or not you love a dress, try to envision yourself walking down the aisle to your fiance in it. And most of all, HAVE FUN!!! 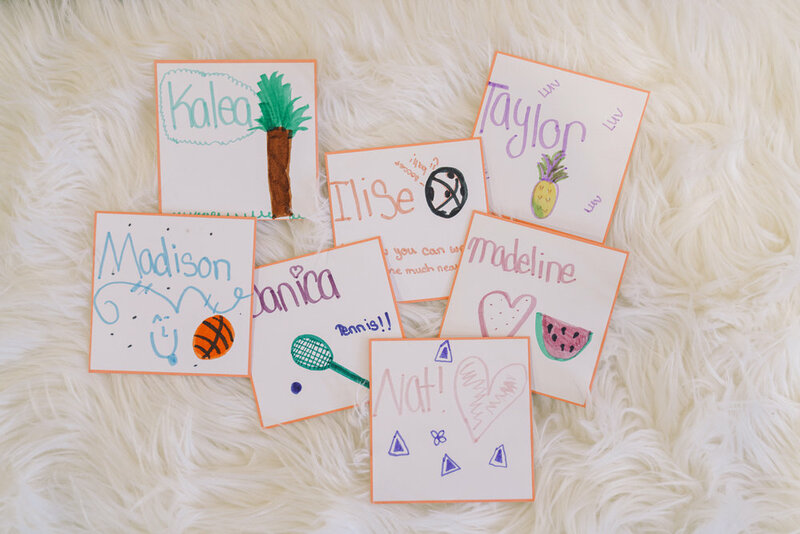 My Funny Galentine is the perfect inspiration for this group of girls that we were hosting for a special Galentines' soiree. Adelyn & her girls are definitely the funniest, bubbliest girls - so fun and quite charming. A few months back, I crossed paths with a very talented friend from high school while having dinner out and we decided that with both of our talents and passion combined, we MUST collaborate soon on a very special project. Michelle is a true artist and you definitely need to follow her on Instagram if you're not yet one of her followers. 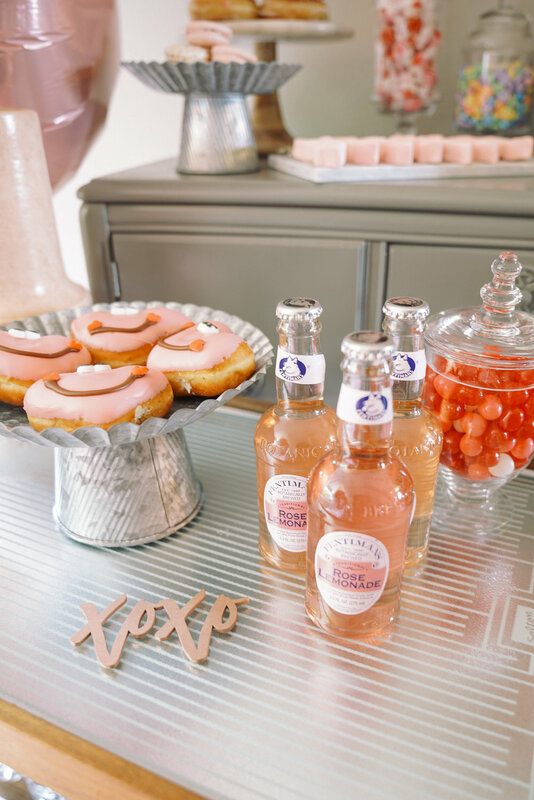 This My Funny Galentine’s party has all the sweets, pink drinks and inspiration you need to host the perfect day filled with love, friendship and laughter! We planned a charming Galentines Day party for Adelyn (Michelle's daughter) and 7 of her closest girls. 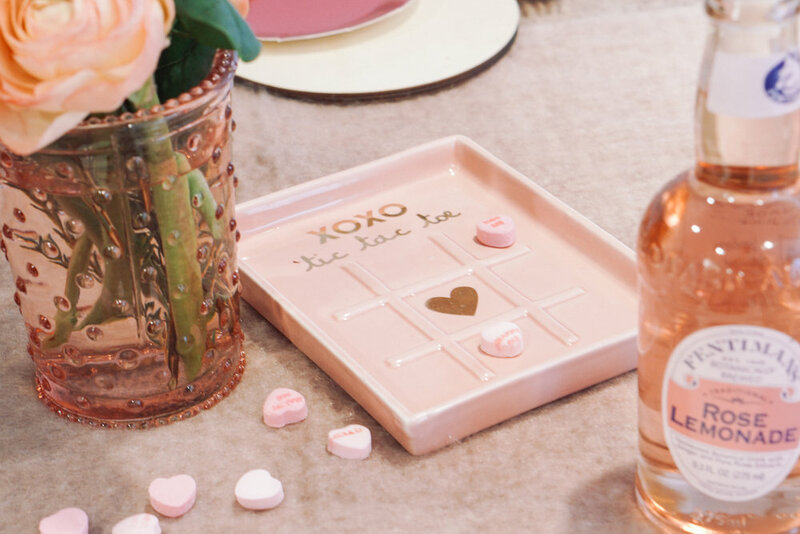 Everything you need to host the perfect Galentines Day Party is here. Yes the truth is Michelle texted all of the girls' moms to invite them to this Galentines' Day party after school. Galentines' Day is all about fun and no fuss so we went the easy route. But we also found Valentines' Day cards that would make the perfect invite to this day. In today's world, we can all use a little more love. What would a Galentines' Day be without any sweets so we knew a dessert spread was another MUST. The dessert table & bar cart were filled with all the must haves snacks for these girls, raspberry french macarons, donuts, heart marshsmallows, Pocky sticks, mini merengues, candy, and a beautiful pink marble cake designed by Amriel (Adelyn's sister, the Rogers family is quite a talented bunch!) 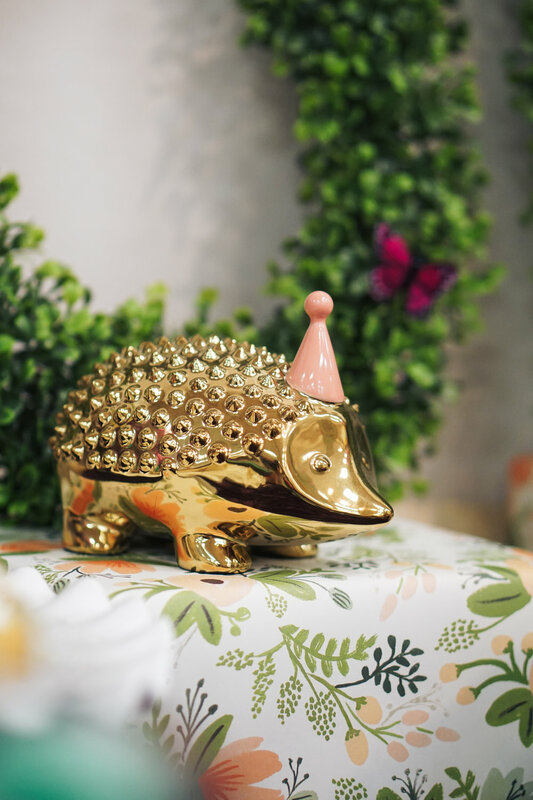 to match our Galentines' soiree. 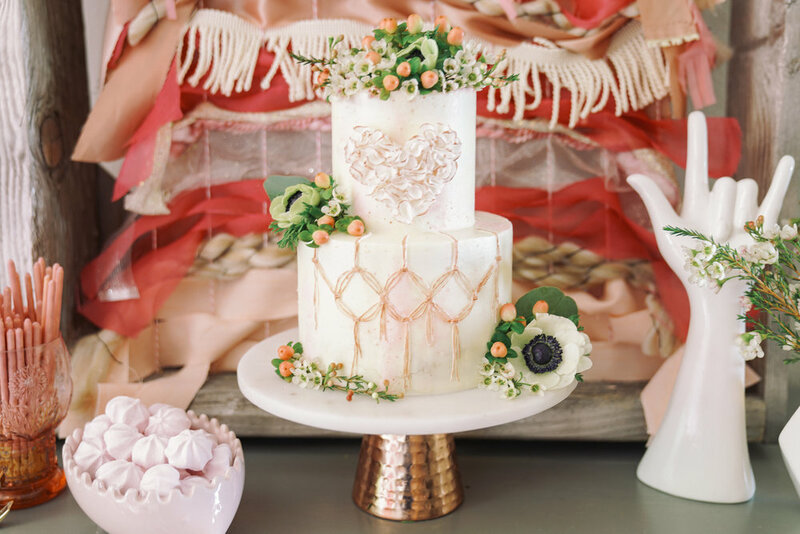 Michelle curated a woven installation that gave the perfect focal point in our dessert table. We served up bottles of these Rose Lemonades to all of the girls - a yummy and girly drink perfect for the occasion. 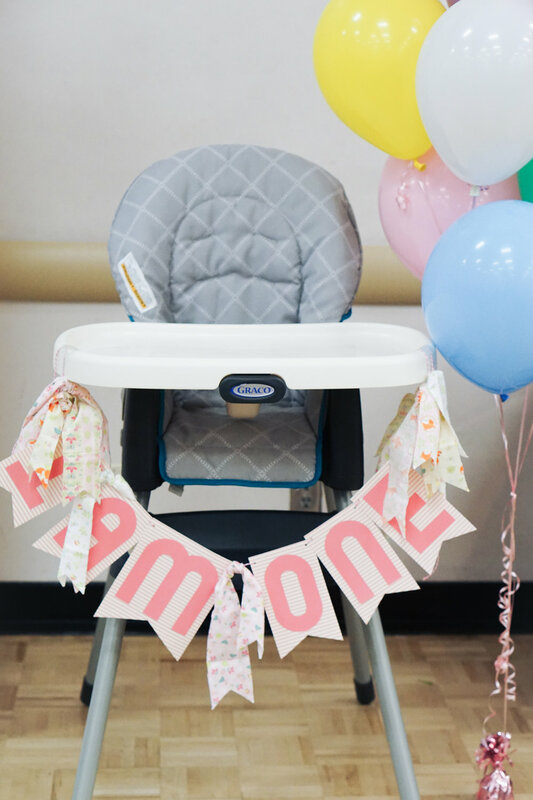 We were inspired with all of the rage of balloon arches and Michelle designed a heart balloon arch as the perfect backdrop for Adelyn & her friends to take photos with their Instax cameras. The heart balloon arch was another inspiration for this Galentines' soiree that was hung in front of a macrame curtain courtesy of Anthropologie. We used a sequined champagne blush tablecloth with an ombre runner for the tablescape. Small floral bouquets with Japanese ranunculus, wax flowers and coffee berries lined up the table. The XO wood decor pieces was a score from one of our favorite stores, Target. 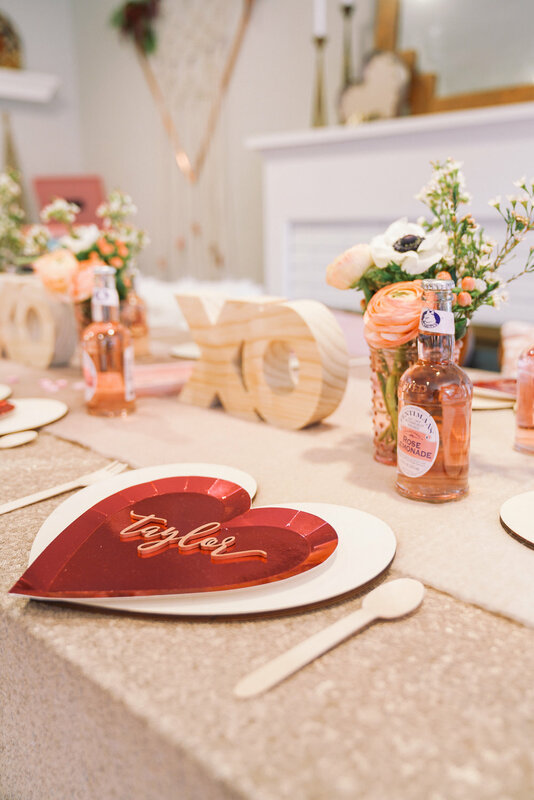 Happily Ever Etched provided these gorgeous rose gold custom laser cut wood names for each of the girls adding a personal touch to each of their place setting -- and a wonderful treat to take home. Instead of streaming through Spotify or Pandora, we opted for some tunes out of the pink Crosley that was used as part of our decor as well. After dinner, the girls decided to do their own Karaoke Showdown that ended the night on a very high note. The girls along with Alec, Adelyn's younger brother exchanged Galentines' cards & messages to each other. Hearing their sweet and very funny messages were the best - things like "you're the beans to my rice you're my BFF". Nestlie & Brian celebrated their beautiful wedding day with their ceremony at the Cathedral of Our Lady of Angels. We've visited the Cathedral a few times for personal visits & mass but this was our first wedding experience. We've always loved the modern architecture of the Cathedral. Did you know that while building the Cathedral, the biggest challenge is to make sure that the design reflects the diversity of all of the people of Los Angeles. Nestlie & Brian's guests were welcomed with a cocktail reception at the Four Points Sheraton LAX Hotel where dinner & dancing later ensued. Nestlie chose a very soft and beautiful blush color palette for their wedding day that just complemented her bridal party and the ballroom. The centerpieces were filled with hydrangeas and blush roses, some of the bride's favorite blooms and we packaged the couples' favorite dessert, french macarons courtesy of Beverly's Best as a thank you gift to all of their guests for celebrating with them. One of my favorite details of their day was the custom wedding cake that the groom illustrated. Sweet & Saucy Shop did an amazing job capturing the couple's request for a traditional cake in the front and a bit of surprise at the back reflecting the couple's personality. Loved working with Nestlie & Brian planning for this wonderful day and wish them well as they look forward to celebrating their first wedding anniversary in a few months.